Anywhere in the world you travel, you’ll come across a crowd, at every major tourist attraction, cameras in hand, clicking away trying to make postcard-perfect photos. Today’s Tip: Ignore them. Most of them have no clue. They are Tourists, not photographers! What few of them realize is, they are not making best use of the available light and when they get home from their trip and view their snapshots, they’ll be horribly disappointed with the under, or overexposed shots they created. 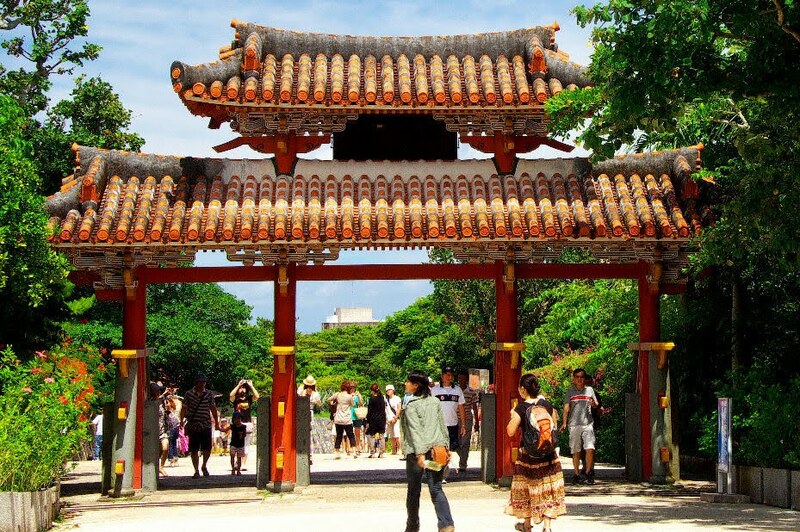 The photo above is probably the most visited attraction on Okinawa, the main gate to Shuri Castle. Millions of visitors pass through this gate after stopping right in front of it to take photos. The black rectangle, between the double-roofed-gate contains Kanji characters and most tourists are trying to capture the writing, as well as, the scenery around the castle. In the early morning, without a powerful external flash, what they are trying to do is photographically impossible! It’s a good idea to watch what the tourists are doing and shoot from the exact opposite direction, sometimes. I always try to make the best use of natural lighting, paying particular attention to the direction of the sun and the shadows it creates. The best lighting for scenery and landscapes, I think, is coming from the side of a subject at about a 45 Degree angle. In this photo, I’d recommend late afternoon sun to capture the gate and Kanji characters on the sign. Another option would be to go there at night and see if the site is lighted with floodlights, which would make the Kanji characters stand-out from the background. I was pleased with this version of the photo and took several with no tourists in the scene for my personal collection. Next time you travel, remember, shoot the attractions from different directions once in awhile and you may come home with some unique and rewarding photos! Stand by for my future Photography Tip: Should you buy a DSLR or a Point and Shoot Camera ? Very useful tip. Other people are often running right in front of my lense when I'm about to take - what I think- a great shot. Patience is the name of the game. That's a great time to switch to manual focus if you've got it. Thanks, you just gave me an idea for a new Photography Tip !